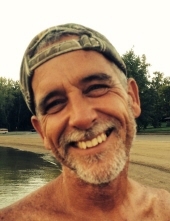 Kent Eugene Goff, 54, of Rockville, passed away on January 8, 2019. Born on October 20, 1964, in Crawfordsville, IN, Kent was the son of Kennard & Bonnie (Phillips) Goff. Kent was a 1983 graduate of Ben Davis High School, where he was a part of the gymnastics team. Always a hard worker, Kent poured his life into his career as a contractor for his own business, K&K Contracting, LLC. Outside of work, Kent loved spending time fishing his pond, eating triscuits and summer sausage, working on his truck, playing with his dog Tucker, and hanging out with his kids, Bailey and Connor. He is survived by children Bailey and Connor Goff, father Kennard Goff, and numerous aunts, uncles, cousins, and friends. Kent is preceded in death by mother Bonnie (Phillips) Goff and brother Scott Goff. Graveside Service will be held for family and close friends. To send flowers or a remembrance gift to the family of Kent Eugene Goff, please visit our Tribute Store. "Email Address" would like to share the life celebration of Kent Eugene Goff. Click on the "link" to go to share a favorite memory or leave a condolence message for the family.